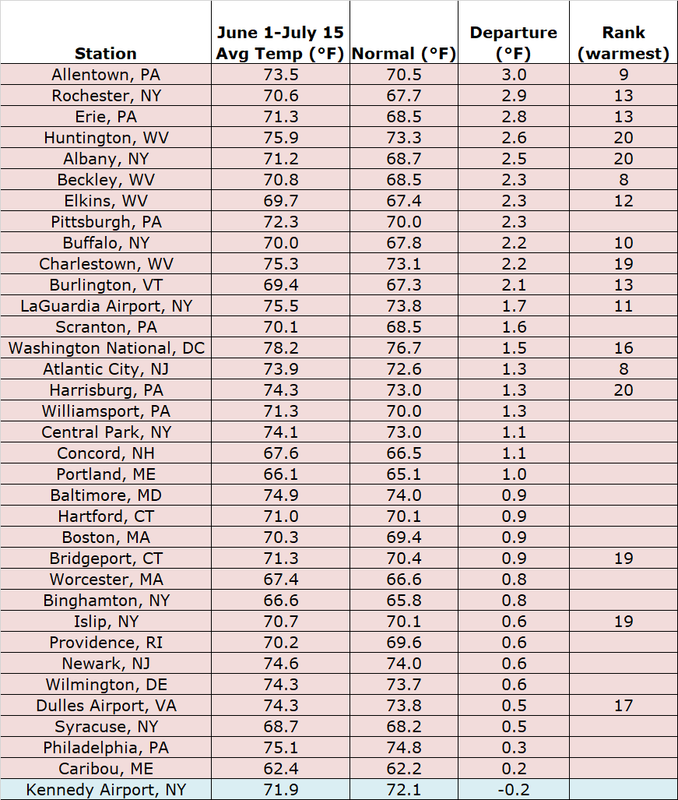 New England and New York, in particular, experienced the largest temperature departures from normal during the beginning of July. A heat wave kicked off the start of July and brought humidity along with record warm temperatures to much of the region. 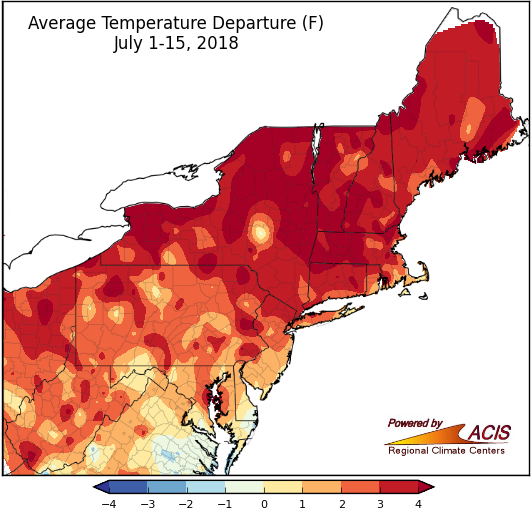 Each of the 35 major climate sites experienced a warmer-than-normal first half of July, and all but six of the major climate sites in the Northeast ranked the beginning of July amongst their 20 warmest on record. 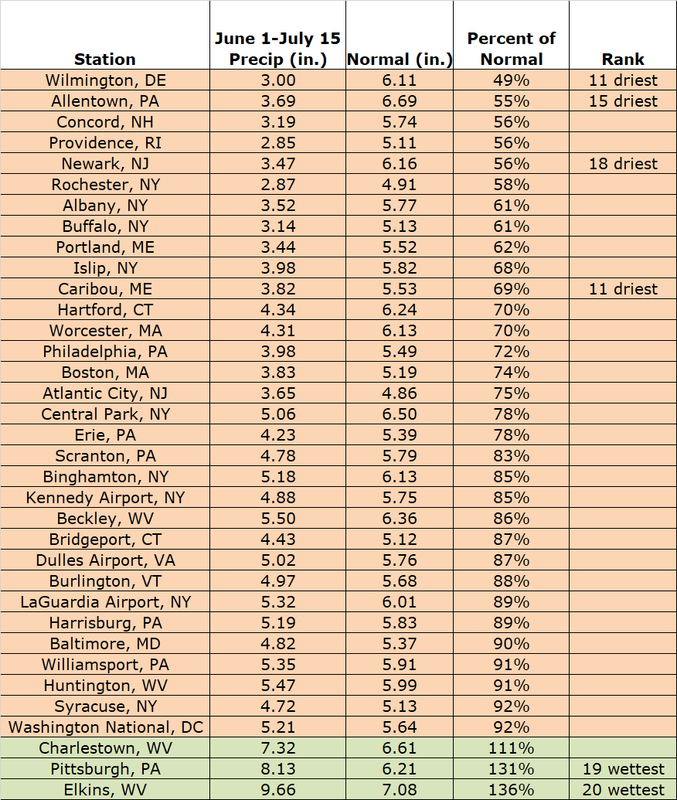 Temperature departures from normal during the first half of the month ranged from 1.1˚F above normal at Dulles Airport, VA to 6.1˚F above normal in Albany, NY. All 35 major climate sites in the region experienced warmer-than-normal temperatures on average during the first half of the month. July has already been drier than normal for many areas within the Northeast. By the middle of the month, only a trace of rain had been recorded in Washington National, DC, ranking this as their driest first half of the month on record. 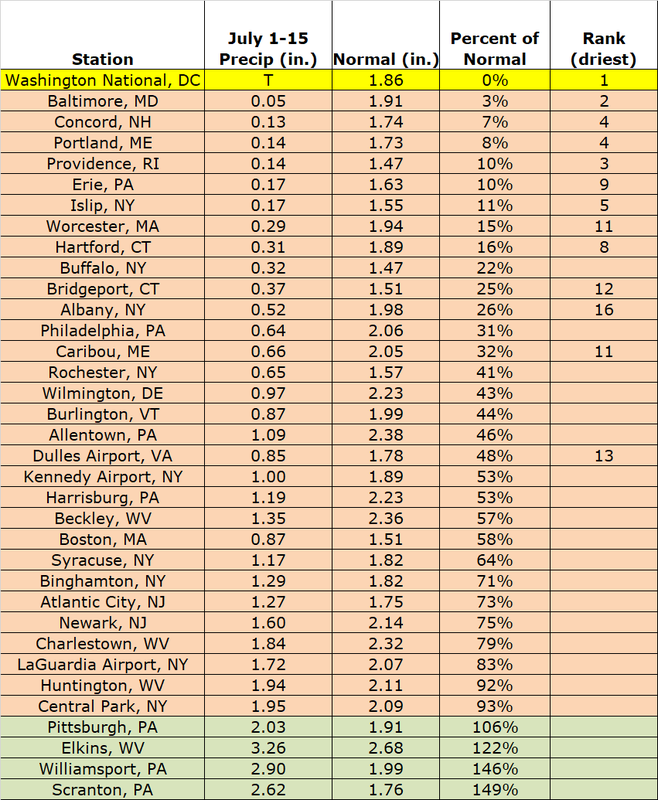 Baltimore, MD, Portland ME, and Concord, NH have also received less than 10% of normal precipitation during the first half of July. For 13 major climate sites within the region, the beginning of July has been among the 10 driest on record. Areas in Pennsylvania and West Virginia are among the few locations that have experienced a wetter-than-normal start to July. 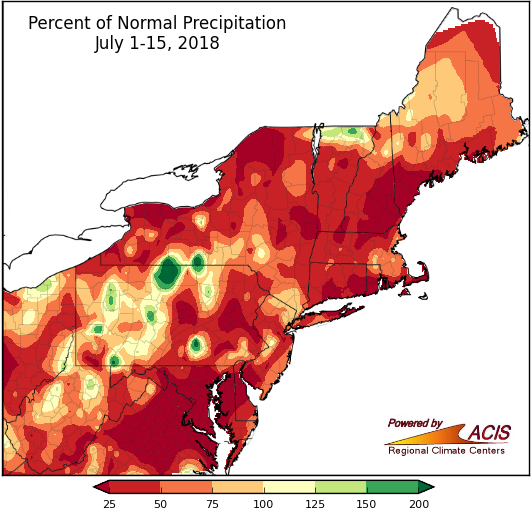 Drier-than-normal conditions have been prevalent throughout much of the Northeast during the first half of July. 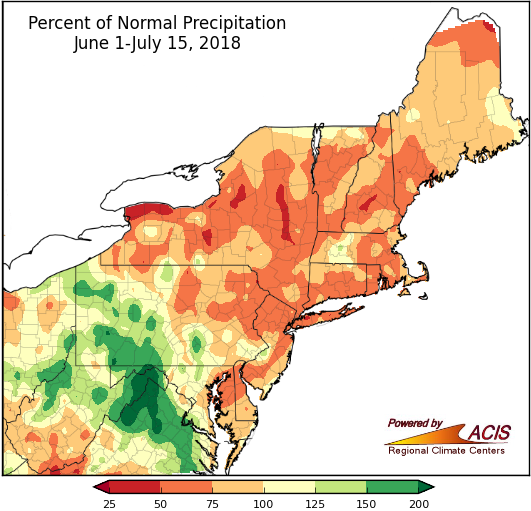 Meteorological summer, which spans the months of June through August, has had a drying trend for areas in the Northeast. Dry conditions are now present throughout much of the region, which is quite the contrast from the beginning of the season in early June, when less than one percent of the region was abnormally dry. According to the U.S. Drought Monitor released July 10, abnormal dryness is currently impacting 27% of the region, with 9% of the Northeast experiencing moderate drought conditions. Only three of the 35 major climate sites (located in either West Virginia or Pennsylvania) experienced a wetter-than-normal first half of the season. Percent of normal precipitation ranged from 49% in Wilmington, DE to 136% in Elkins, WV during the first half of the summer. Drier-than-normal conditions in the region have been recorded during the first half of the season. The first half of meteorological summer has been warmer than normal for all but one of the 35 major climate sites. 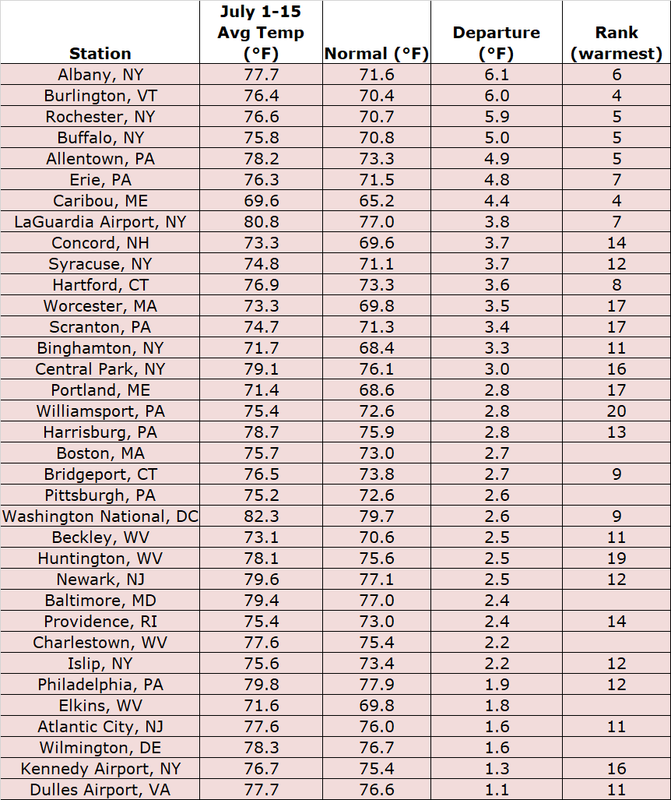 After a cooler-than-normal June for many of the northern states in the region (including some late-season frost in parts of northern New England), the beginning half of summer was ranked among the 20 warmest on record for 17 major climate sites in the region. 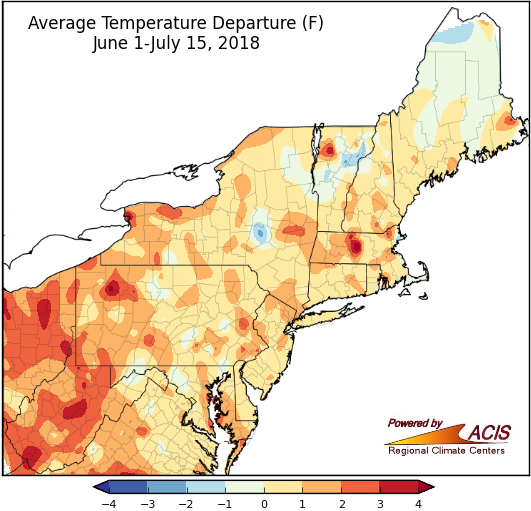 Average temperatures from June 1 through July 15 ranged from 0.2˚F below normal at Kennedy Airport, NY to 3˚F above normal in Allentown, PA.
Much of the region experienced near-normal temperatures during the first half of the season. The first half of summer was warmer-than-normal for almost all of the major climate sites in the Northeast.